Ting Cui, 1st place Gold Medal in Novice Ladies at the 2017 Bavarian Open in Oberstdorf, Germany Feb. 15. 2017 New Year's Invitational, Feb. 18 -- Kathy Sack and Dennis Glorioso, 2nd place, Couples Dance (PD), Fiesta Tango; Diana Cheng, 1st place, Free Skate IJS Masters Int/Nov and 3rd place, Light Entertainment, Master/Gold I-II; Dennis Glorioso, 1st place, Free Skate (IJS), Gold Mens. 2017 Reflections Synchro Invitational Hershey PA Feb 19-20 Ella Maddalone with Gardens Synchrocity, 7th place Pre-Juvenile; Chesapeake Synchro: Matilda Trimble and Reese Bruning, 1st place with Preliminary team; Megan Price 4th place with Beginner 1 team. Eastern Adult Sectionals: March 10-12, Westwood, N.J.: Dennis Glorioso, 6th place in Championship Free Skate, Adult Gold; Diana Cheng, 3rd, Championship Free Skate, Adult Gold; Martin Romanik, 7th in Championship Free Skate, Adult Gold; Mary Williams, 5th in Free Skate - 6.0, Adult Bronze. Diana, Marty and Dennis qualified for Adult Nationals In Wake Forest, N.C., April 18-23. Eastern Sectional Intercollegiate Competition at MIT, Feb. 4-5: Chloe Roberts, Gold in Pre-Juvenile Ladies; Lauren Carrig, Bronze in Intermediate Ladies, Bronze in Gold Dance and International Dance; Becky Blackstone, 7th in Intermediate Ladies; Margot Chirikjian, 7th in Juvenile Ladies; Nikki DiMarino, 5th in Pre-Juvenile Ladies; Gillian McCarran, 8th in Preliminary Ladies, 7th in Preliminary Dance; Lindsey Armah 7th in Pre-Preliminary Ladies, 9th in Preliminary Dance; Anna Shchelokova, 9th in Pre-Preliminary Ladies; Brooke Coyle, 8th in Pre-Preliminary Ladies. At Liberty University and at University of Delaware in March, BFSC members competing: Wendy Shu, Lindsey Armah, Erin Campbell, Anna Shchelokova, Lauren Carrig, Brooke Coyle, Nikki DiMarino, Becky Blackstone, Chloe Roberts. 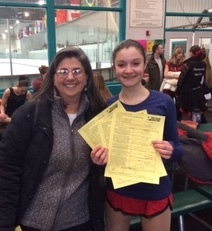 Congratulations to skaters who passed tests: Emily Feldman, Senior Moves; Mandi Koch, Adult Gold Moves; Katie Koster, Junior Moves; Mary-Jean Joyce, European Waltz and Fourteenstep; Nicole DiMarino, Canasta Tango, Rhythm Blues; YiYun Li, Preliminary Moves; Sierra Weems, Preliminary Moves; Kristen Mossman, Pre-Juvenile Moves; Matilda Trimble, Pre-Juvenile Moves; Delayna Good, Pre-Juvenile Moves; Madeleine Howard-Frank, Intermediate Moves. I would like to recognize Haley Nickel for her contributions and efforts helping the LTS program. Haley dedicated her time helping first-time skaters get comfortable on the ice and helping them overcome their fears, by giving them individualized attention. Haley demonstrated patience and kindness, so the kids were quick to trust her to help them achieve their skating goals. She is an absolute joy to work with and we are lucky to have Haley on our team. I look forward to seeing her coaching skills develop!